The first self-sufficient boat powered only by emission-free energy will start a six-year trip around the world in the spring. 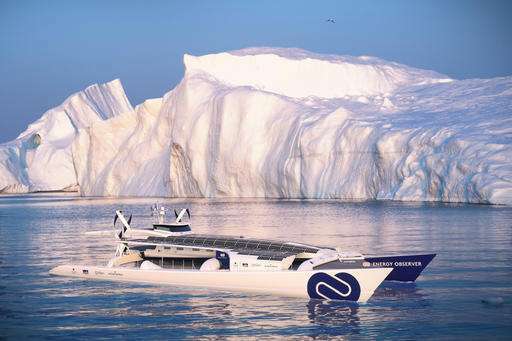 Energy Observer, a former multi-hull race boat converted into a green vessel equipped with solar panels, wind turbines and a hydrogen fuel cell system, will be powered by wind, the sun and self-generated hydrogen. The 5 million euro ($5.25 million) boat, which is currently in a shipyard in Saint-Malo, will set sail from the Brittany port and will make its first of 101 stops across 50 countries in Paris as part of a six-year circumnavigation. "This boat will demonstrate that there are many solutions for energetic transition," said French environmentalist Nicolas Hulot, who attended the project presentation on Wednesday at the UNESCO headquarters. "All solutions are within nature." Designed in 1983 under the supervision of Mike Birch, the boat enjoyed a successful career in open-sea sailing races, including winning the Jules Verne Trophy in 1994, with Peter Blake at the helm. The Energy Observer project was conceived in 2015 by skippers Frederic Dahirel and Victorien Erussard, with scuba diver and filmmaker Jerome Delafosse also behind the project. "I'm passionate about new technologies," Erussard said. "Building a self-sufficient boat could have seemed utopian, but this is going to be an incredible vessel. It's very promising for the future." 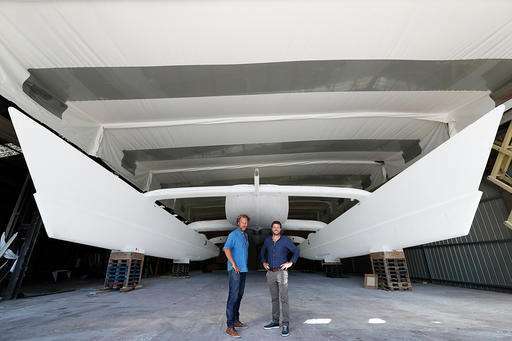 The technology fitted to the 30.5-meter (100-foot) boat, which is also equipped with a kite sail, will enable the production of hydrogen through electrolysis process. "We bank on the diversity of renewable energies," Essuard said. "And if there is no sun or wind, or at night, we have the option to draw in our hydrogen reservoirs. We will produce this hydrogen in a decarbonized manner through electrolysis of the sea water." According to Florence Lambert, the director of the CEA Liten research institute which devised the boat's energy system, Energy Observer is a good example of what energy networks will look like in the near future, with its well balanced mix of renewable energies and hydrogen storage system. "We are not talking about the delirium of an explorer or a scientific," she said, adding that the prospects for hydrogen-powered transport look bright. Mark Z. Jacobson, an engineering professor at Stanford University who develops roadmaps for countries to convert to 100 percent renewable energies by 2050, proposes that transportation worldwide be transformed into a combination of battery-electric transport and hydrogen fuel cell-battery electric hybrid transport. "I believe that it is fantastic that a boat powered by hydrogen and electricity will travel the world," he said in written comments to The Associated Press. "It is an important step forward and consistent with this proposed path to 100 percent clean, renewable energy worldwide for all purposes to solve energy security, job creation, air pollution, and climate problems." Of course this is good - though after ten thousand years of sail the windjammer of the early 20th c. brought this to a fine art with thousands of tons of cargo, and could circumnavigate in a couple of hundred days. And could again! Exactly. As a small boat sailor myself, now I have a tiny inkling of what Native Americans feel every time they read about their land being "discovered." The age of commercial sail lasted up to World War 2. That's why there was a commercial sail captain (Alan Villiers) still around to sail the 1950's replica of the Mayflower from UK to USA. brought this to a fine art with thousands of tons of cargo, and could circumnavigate in a couple of hundred days. And could again!! I dunno if sails would be *fully* adequate to haul one of today's super-cargo ships accross the oceans at a constant 21-25 knots (though there have been pilot projects to decrease fuel consumption by adding kite-like sails). We're talking 200k tons deadweight and more. A hydrogen engine could, though. OK, antialias_physorg, to un-over-simplify. Hydrogen is, of course, good, but quite nice to avoid fuel: windjammer, but obviously bigger, by a linear factor of two-three (observe square-cube law). Traditional barque rig that was more highly evolved for the purpose than modern wingsails, kites, etc. Modern materials for spars, rigging, sails. Modern control systems for sail handling. Photo-voltaic sails, ballast batteries, electric auxiliary power to get through doldrums. It's not just about making new windjammers. See Gate of Grief by William Rollo on Amazon if interested. The only reason that this renewable energy sail electric hydrogen boat might make it around the world a couple of times is because it is super-duper lightweight. It's a really good exercise in engineering and such like. But there nothing practical in him. Cher, while you are pontificating about the linear factor with the two-three square-cube laws,,,,, do the actual maths. Using this this (or any other of today's) technology, to replace a single medium size freighter would have you building something 20 to 30 times larger and more complex to carry the same load, and 50 or so times the costs. Do have any idea of what it takes to carry a 200,000ton dead weight cargo through an ocean? Oh yeah, I almost forget. Why you come to the physorg site to push a novel that nobody will publish except your self on the Amazon Kindle? Don't you think you should pay like like other the other physorg advertisers? Cargo ships need planning security. You need to know - to the day - when the ship will be where. Any day lost is a huge amount of money lost. Lastly, if you put all this rigging and whatnot up top you complicate the loading/unloading process. I can see these free flying kite things making a contribution. But I'm pretty sure going back to full sails is out of the question. I hadn't realised there were so many of you who had actually done the sums. But you should have realized that this is a science and technology place where a lot of the Skippys posting might be actual engineers who have done enough sums in the real world to know that you have not,,,,, eh?